Currently, all interior roads (save for the one connecting Canyon Village and Tower-Roosevelt, through the Dunraven Pass) are open to oversnow travel. The Dunraven Pass is closed to all vehicle travel. Last week, the majority of interior park roads and winter facilities opened for the season. The road between the North and Northeast Entrances is open year-round to car travel. 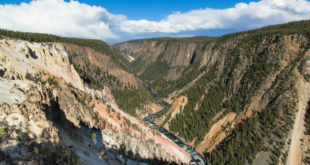 You can see the full list of opening and closing dates for Yellowstone National Park here.